to grass seed and beyond. All our products are designed with similar beneficial properties in mind to make sure that there is a clear need for our offering: Low cost, low weight, easy-to-transport, easy-to-lay, long shelf life, easy-to-handle & to cut to shape, decrease of irrigation needs, decrease of weed control measures, decrease of usage of fertilizers & pesticides, no expansion upon watering and biodegradable raw materials. The build-up of the products by applying the coating directly to the seed has significantly less impact on the environment than traditional foliar or soil application. - … of having to lay rolls of turf on the same day, of carrying heavy, dirty rolls especially when it is wet, and, of making sure turf roots establish well in its new soil. - … with slow-establishing grass pitches through direct seeding. Erosion by wind, rain & birds and poor seed distribution allow weeds to easily mix between the grass sprouts, thereby undermining the establishment of a high quality thick lawn. Above illustration shows a simple impression of how seed rolls are applied. 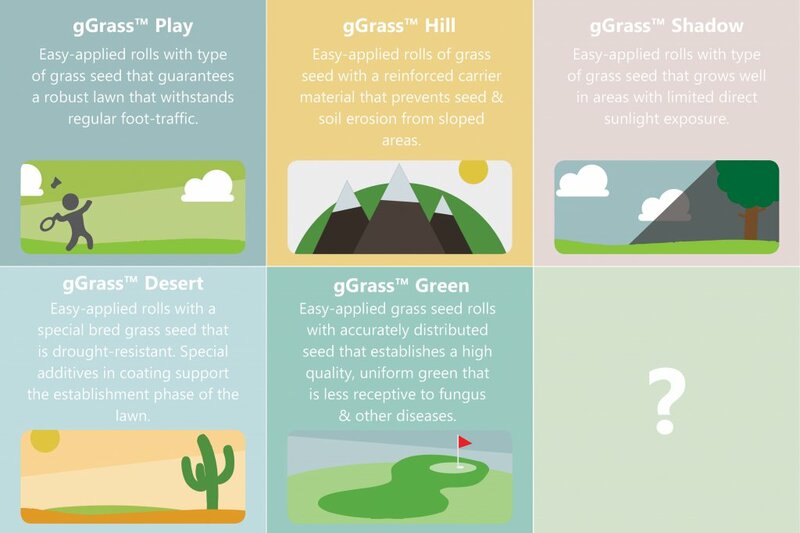 The acquired grass-seed rolls can be rolled-out on a moisturized flat surface. As soon as the product is laid it needs to be covered with a thin layer of soil. When the whole area is covered it needs to be watered thoroughly to ensure that rolls with seed stick well to the soil so that erosion is avoided and a stable germination bed created. Within a couple of weeks, depending on weather conditions, the lawn can be mown and used.